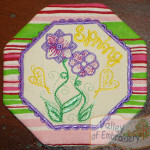 Mug rug – in the hoop design (ITH) + easy instructions. 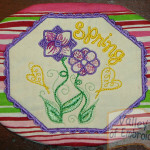 No final hand-stitching required: it’s all in the hoop! 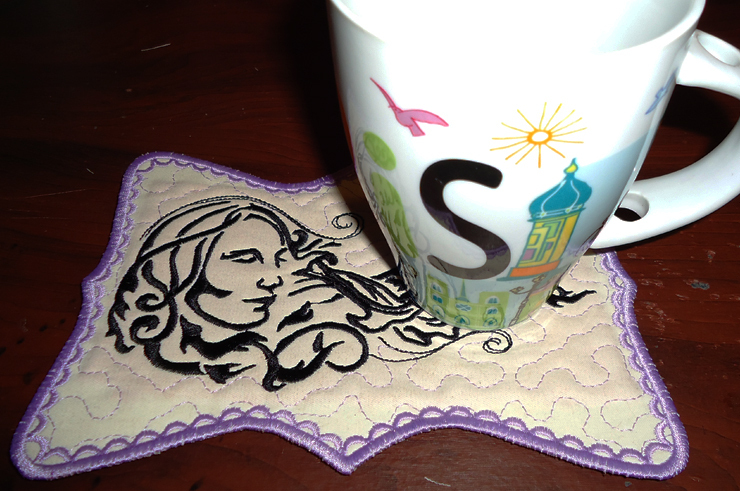 Mug rug – in the hoop design (ITH) + easy instructions. 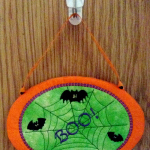 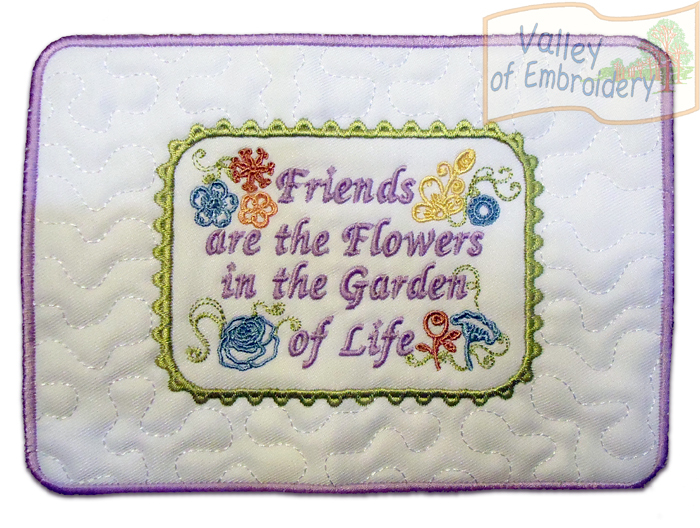 Comes with decorative satin border: no final hand-stitching required, it’s all in the hoop! 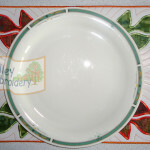 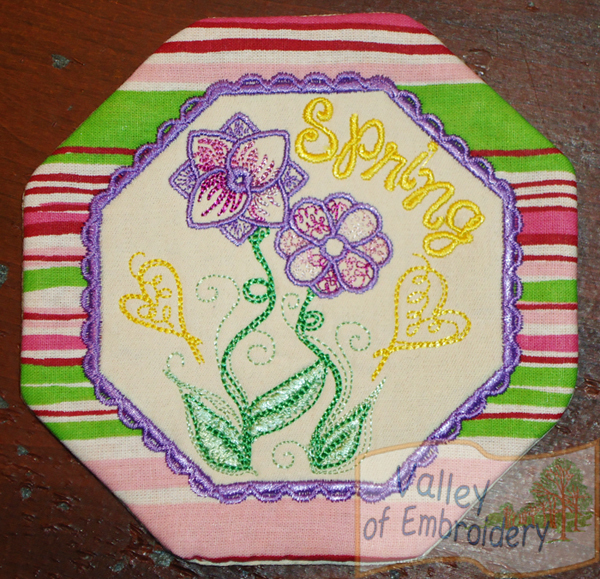 Mug rug – in the hoop design (ITH) + instructions with pictures step by step. 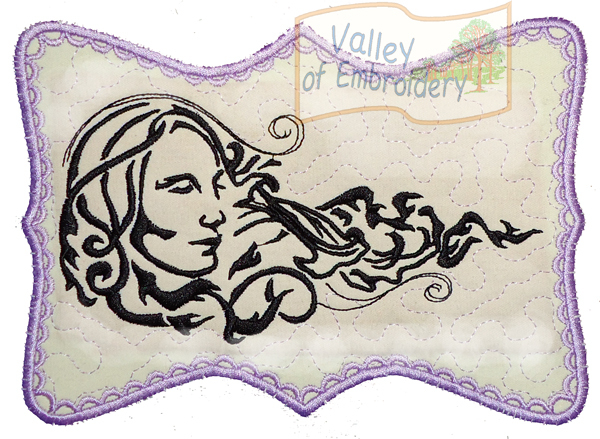 Comes with decorative satin border: no final hand-stitching required, it’s all in the hoop! 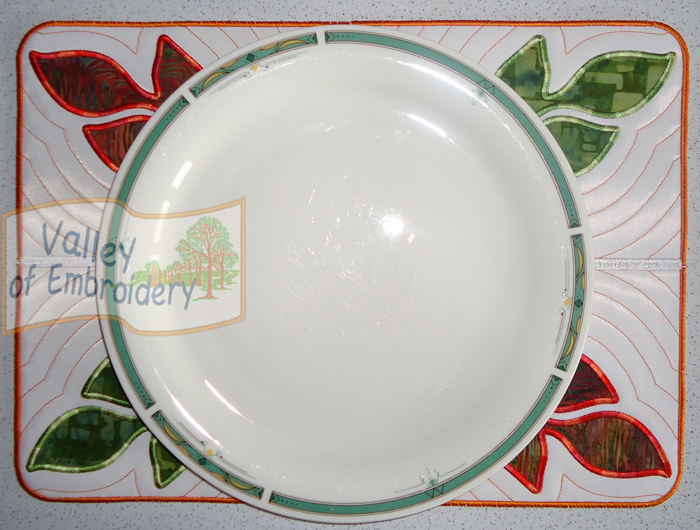 Water soluble stabilizer required. 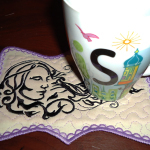 Mug rug – in the hoop design (ITH) + instructions. 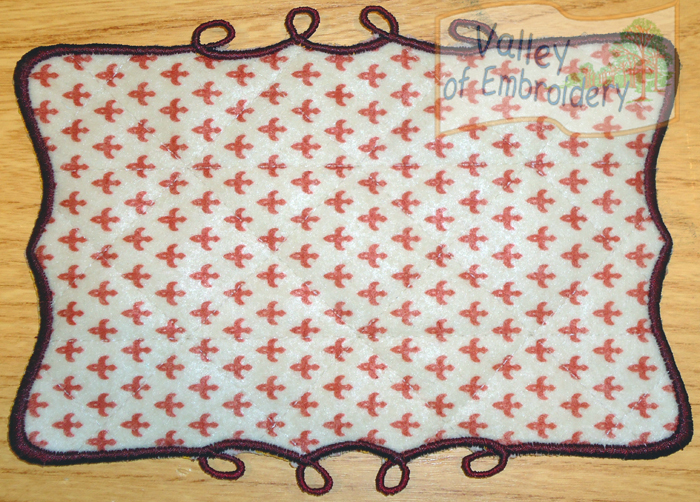 Comes with satin border: no final hand-stitching required, it’s all in the hoop! 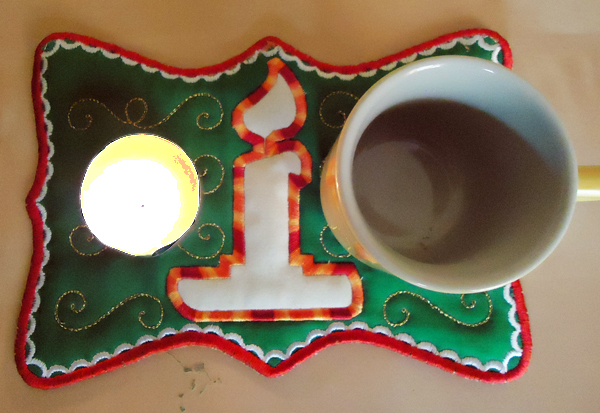 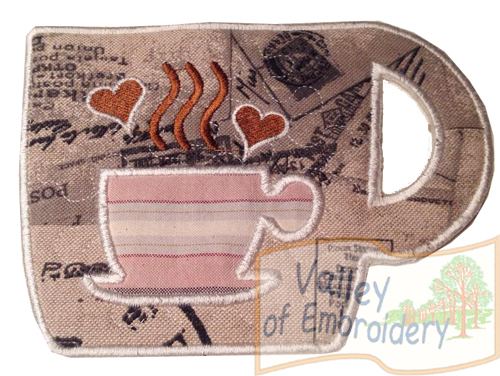 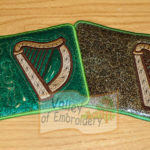 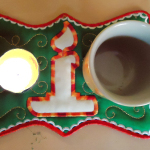 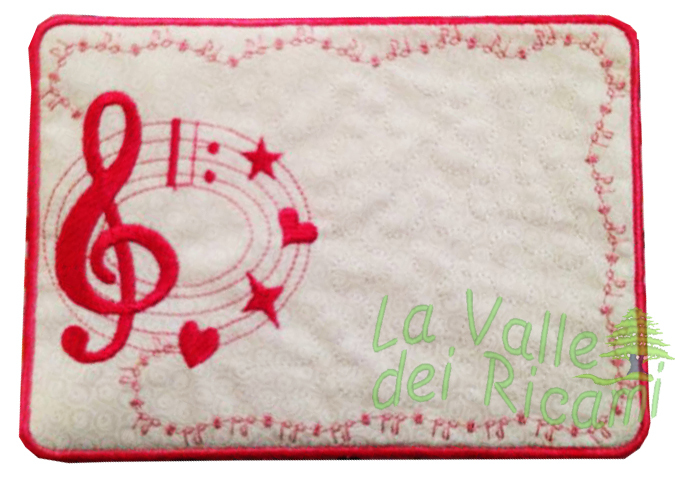 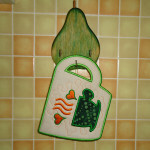 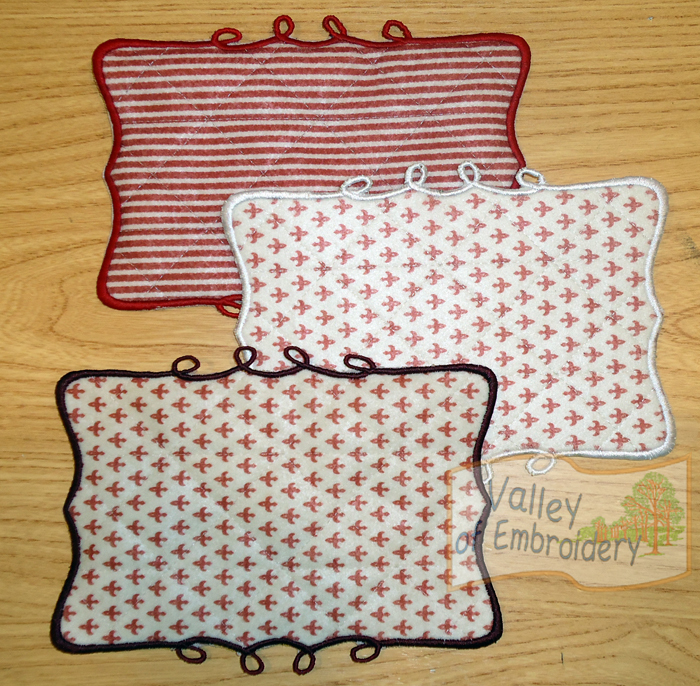 Mug rugs + coaster – in the hoop design (ITH) + instructions and pictures step by step. 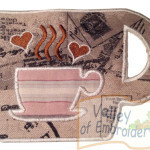 Comes with satin border: no final hand-stitching required, it’s all in the hoop! 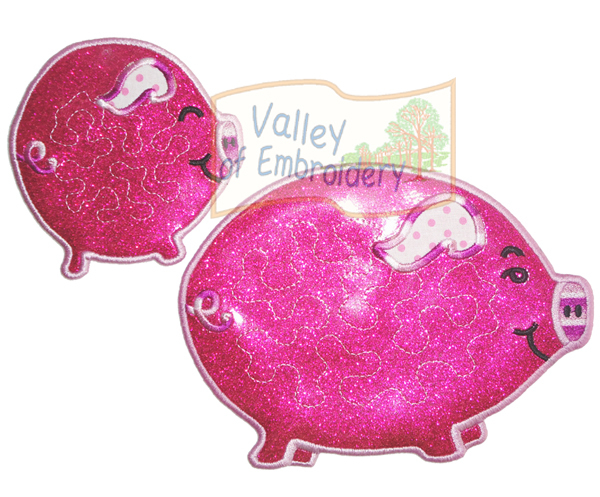 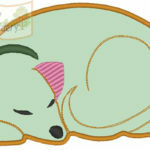 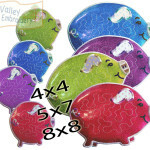 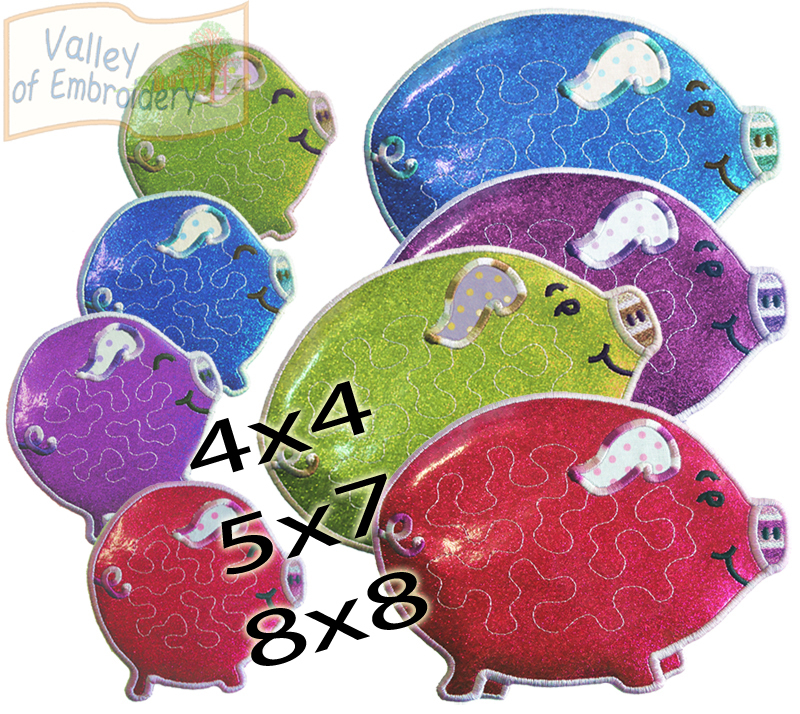 You’ll receive 3 sizes for this cute piggy: 4×4, 5×7, 8×8: 3 designs in total! 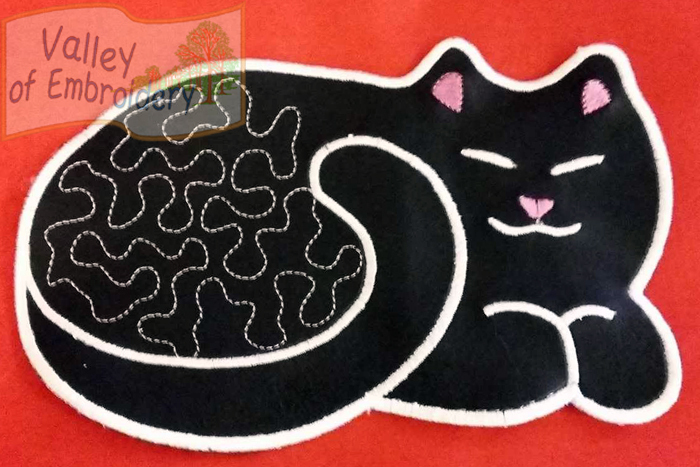 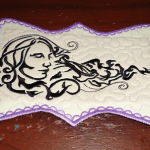 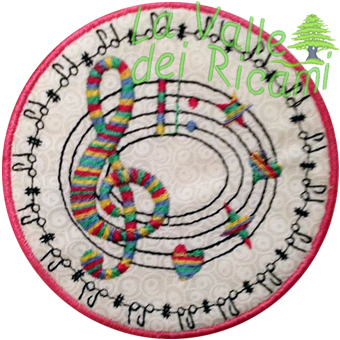 Mug rug – in the hoop design (ITH) (5″x7″ hoop) + instructions and pictures step by step. 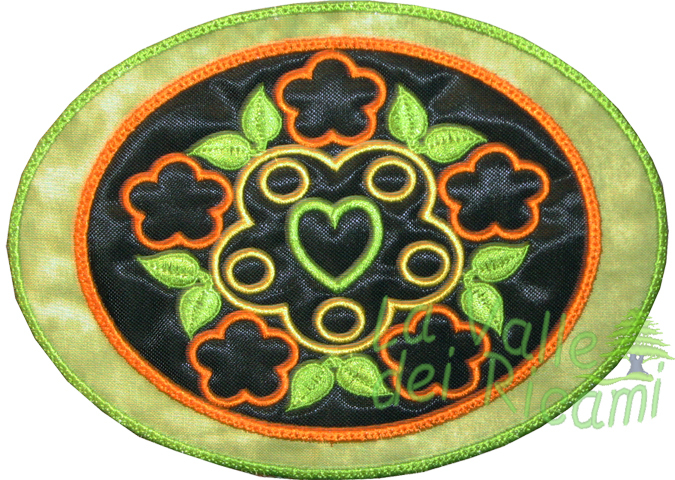 Comes with satin border: no final hand-stitching required, it’s all in the hoop! 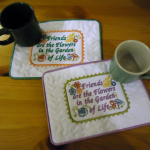 MUG RUG and PLACEMAT at the same time! 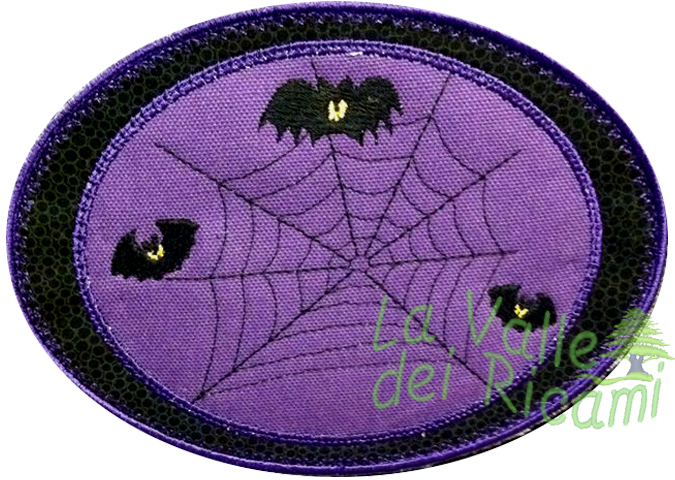 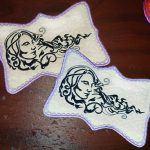 – in the hoop designs (ITH) (5″x7″ hoop) + instructions with pictures step by step. 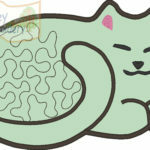 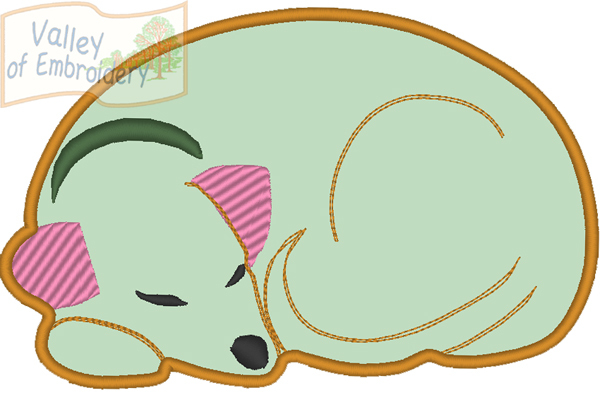 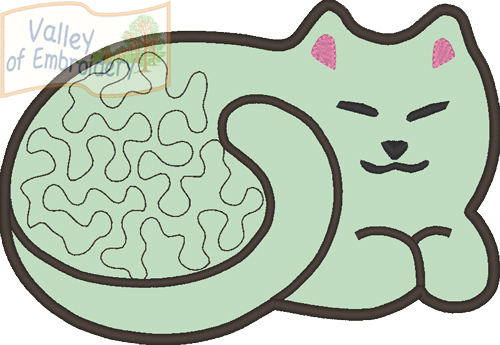 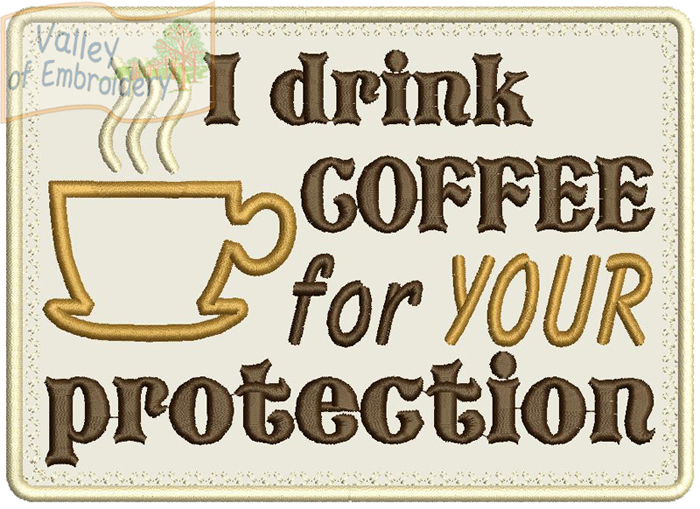 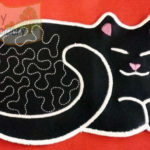 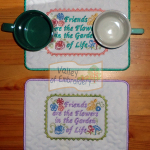 Set of TWO DESIGNS for this project, which can be a single MUG RUG, using ONE of the 2 elements, OR a complete big PLACEMAT for your table, measuring about 14″x10″ (35×14 cm), when assembled. 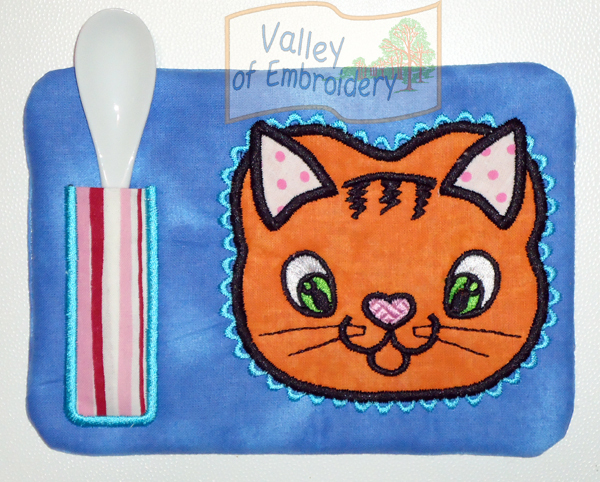 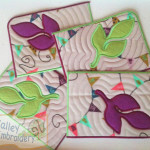 It’s very easy: you’ll receive 2 designs (same design, flipped) and you’ll stitch them twice for each one. 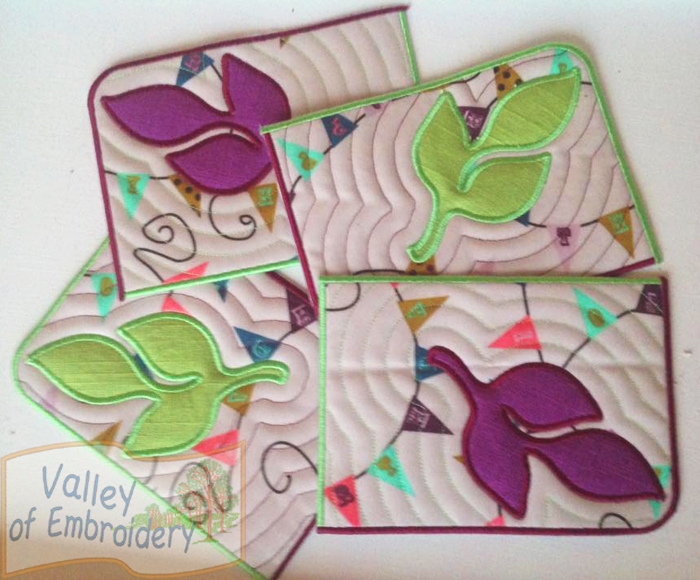 When you have 4 elements done, you sew them together by easy zig-zag seam with your sewing machine. 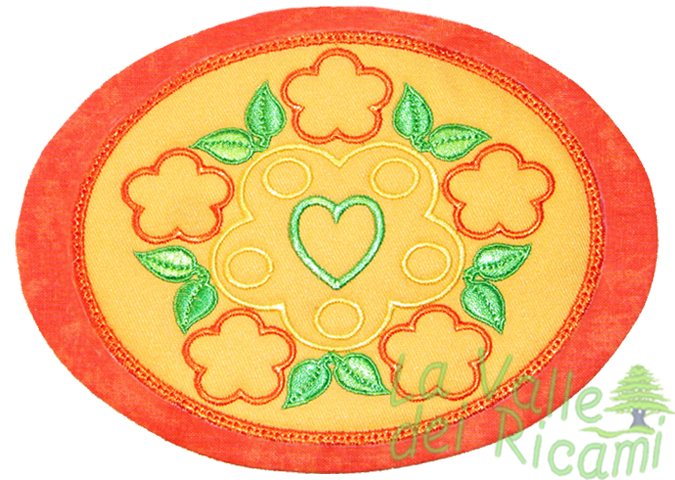 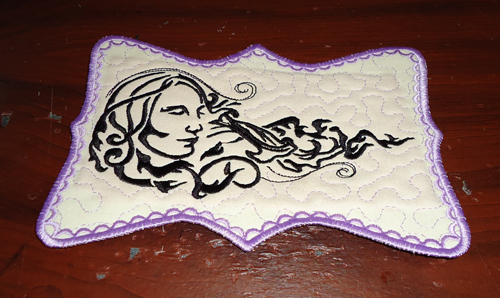 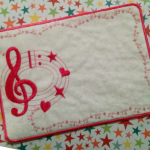 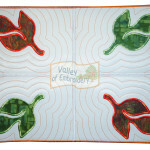 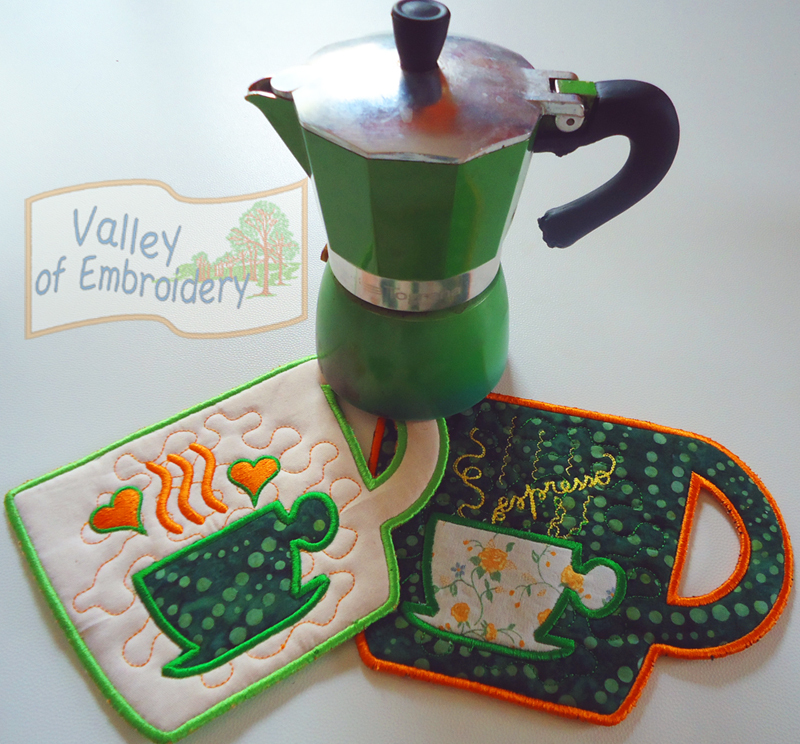 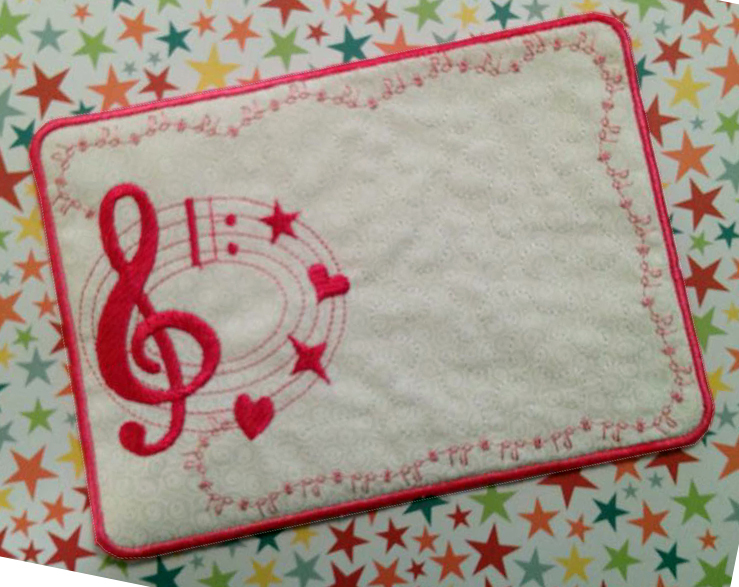 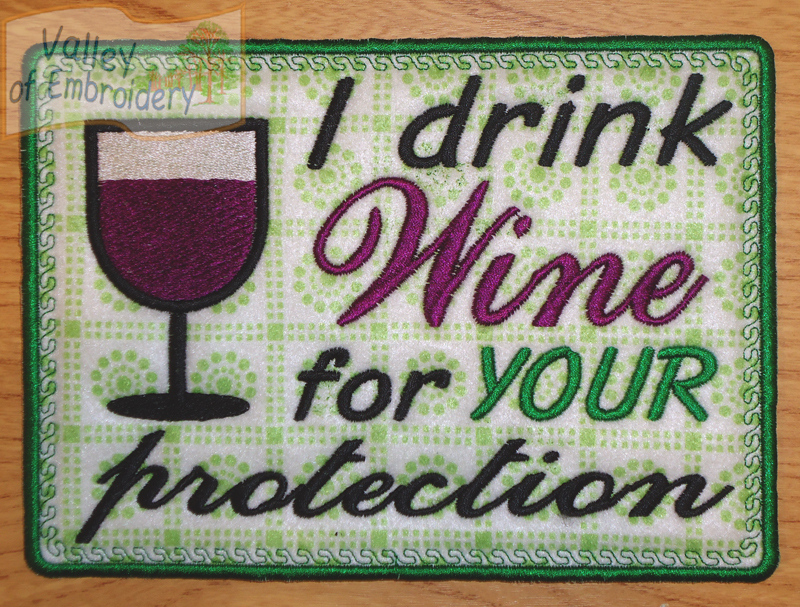 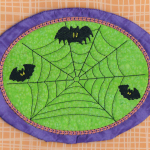 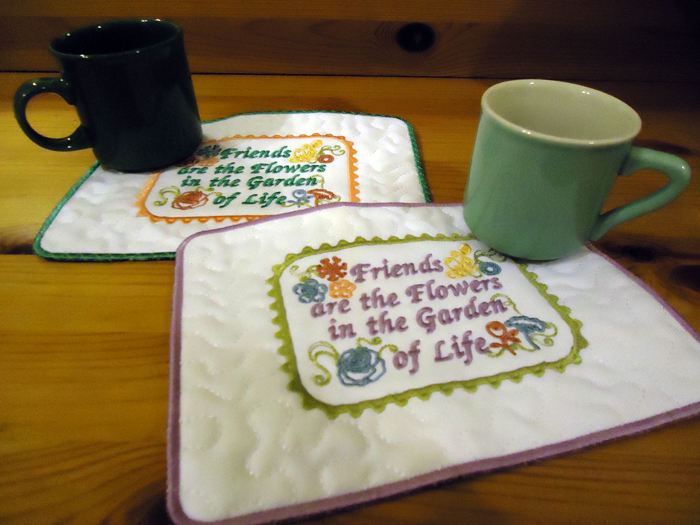 Create a stunning set of placemat and mug rugs, with endless choices of colors and materials! 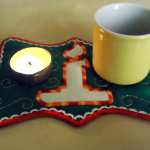 Mug rug/hot pad/coaster – in the hoop designs (ITH) (5″x7″ hoop) + instructions. 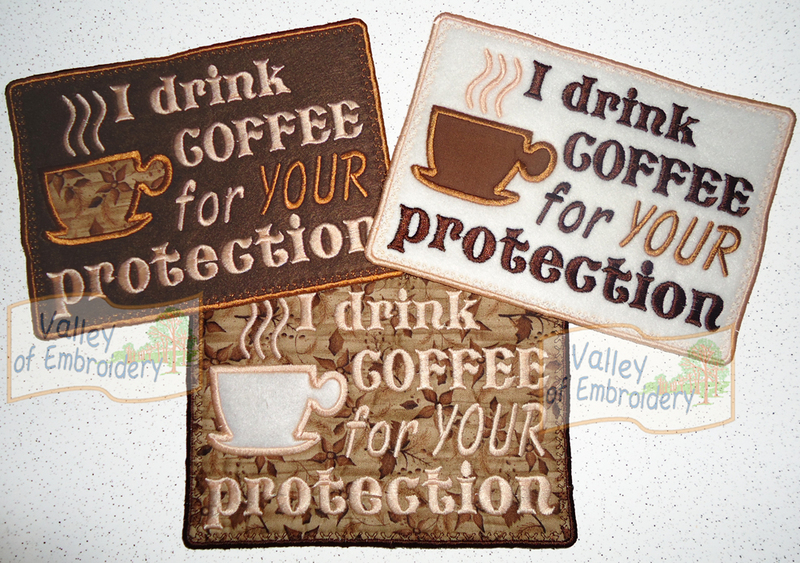 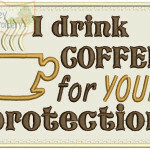 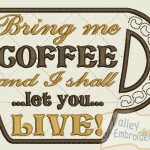 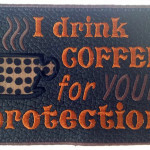 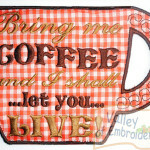 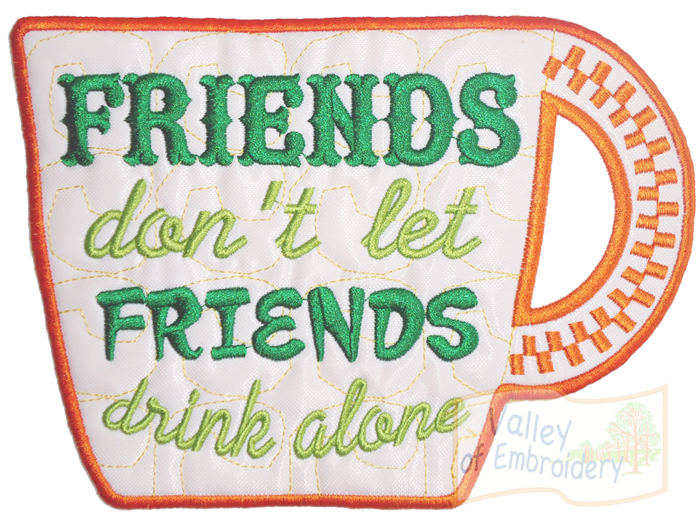 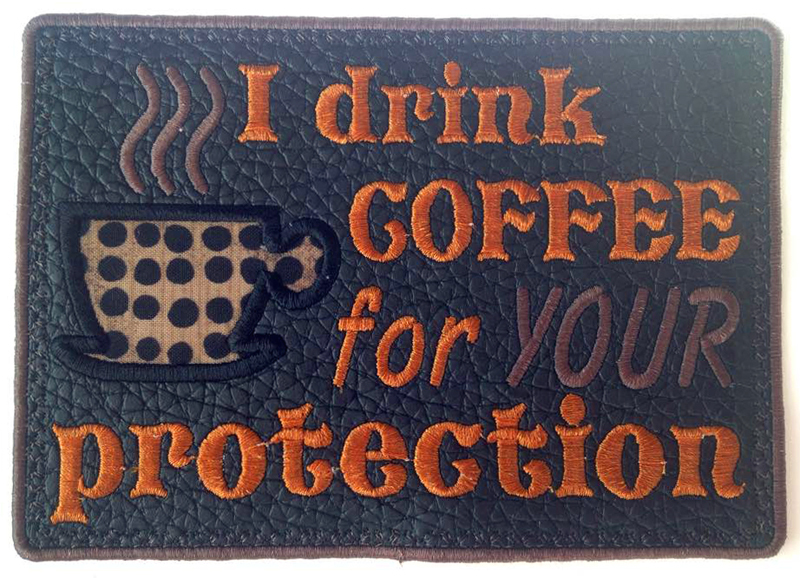 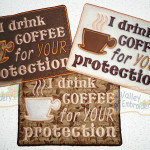 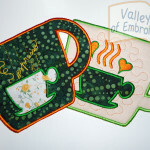 Set of TWO DESIGNS for these mug rugs/pot holders/hot pads/coasters. 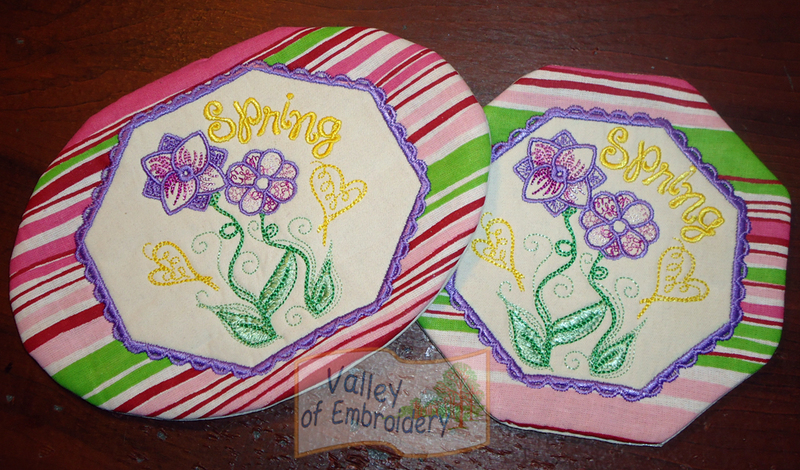 Let’s welcome the upcoming Spring with this cheerful set embellished by a freehand drawing. 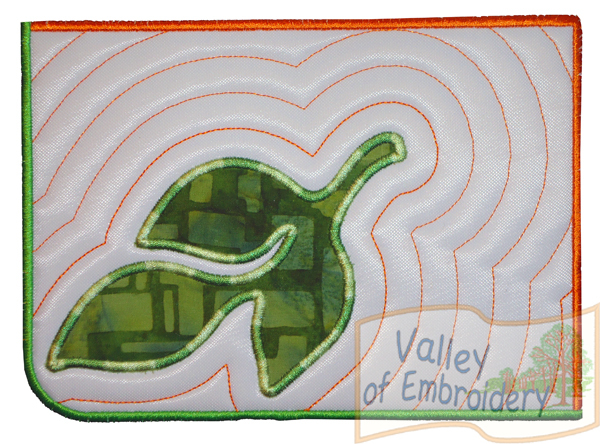 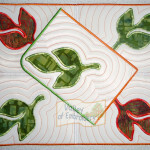 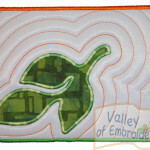 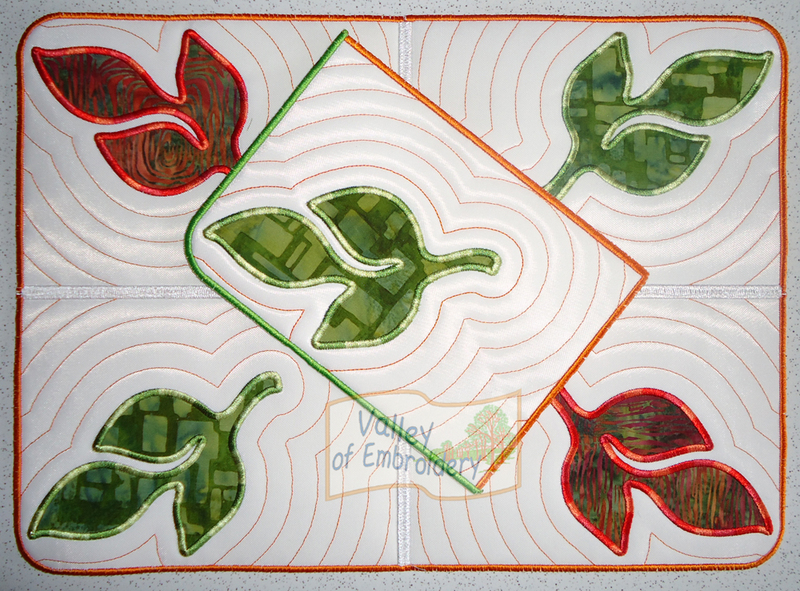 This project has to be turned inside out after the embroidey, so a quick final seam is needed to close the small hole. 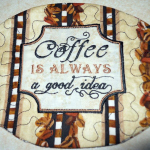 Mug rug/hot pad – in the hoop design (ITH) (5″x7″ hoop) + instructions. 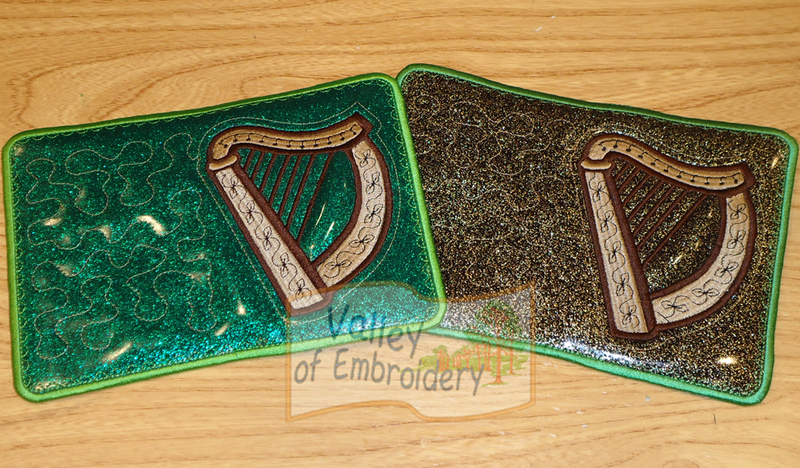 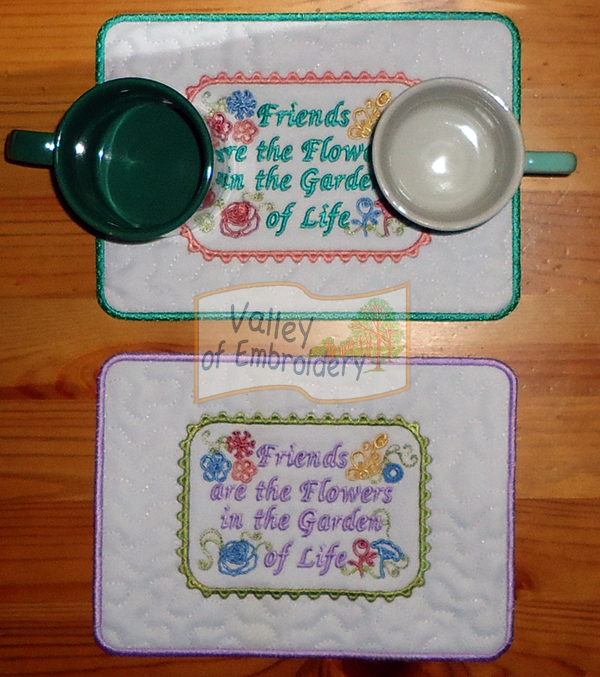 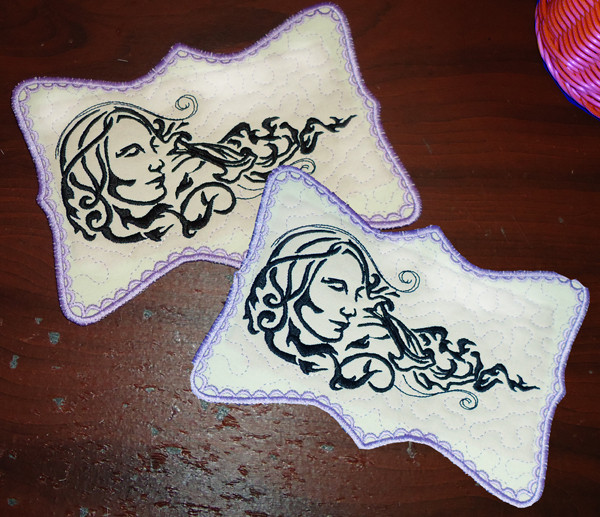 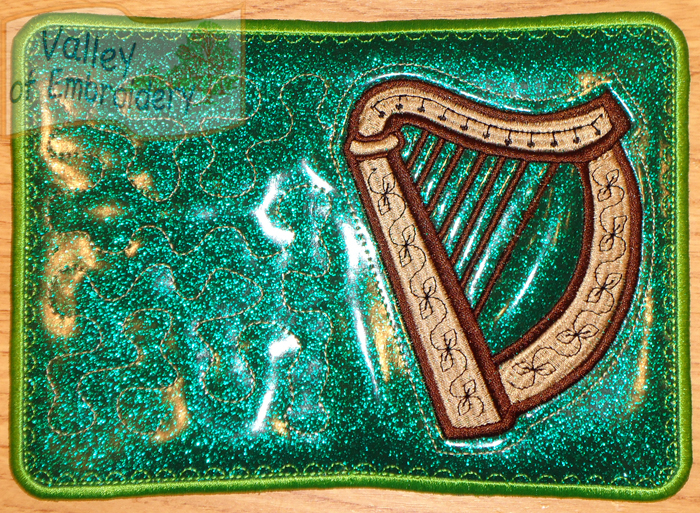 Set of TWO DESIGNS for these mug rugs/pot holders/hot pads. 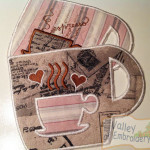 You can hang them from the hanger of the cup! 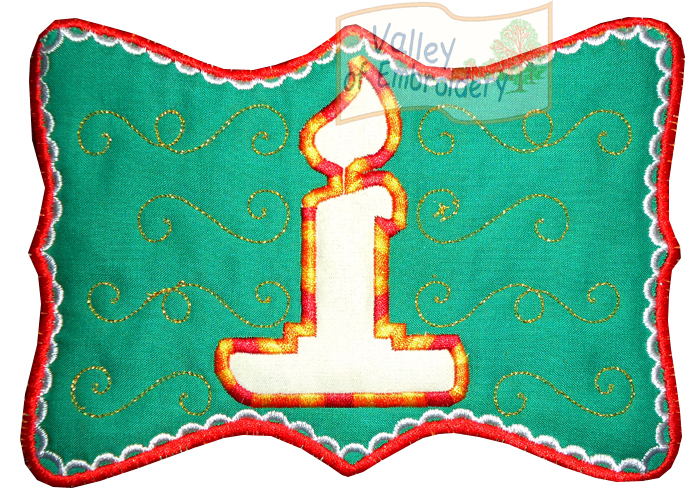 They come with instructions and are made completely in 1 hoop, with no hand seams requested. 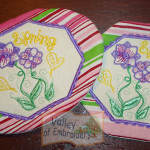 Very easy and fun to do! 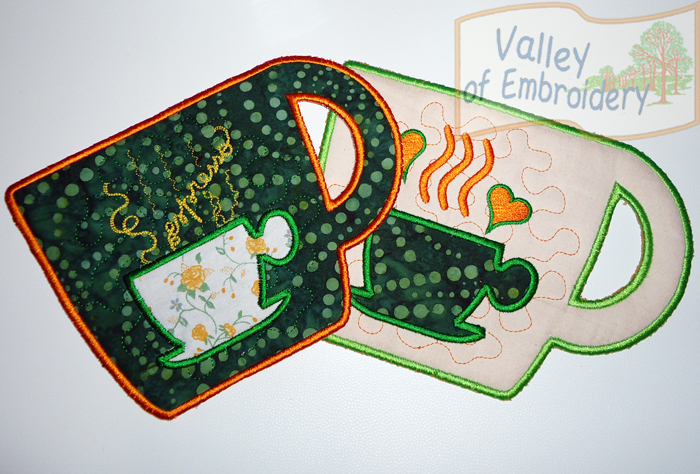 Mug rug – in the hoop design (ITH) (5″x7″ hoop) + instructions and pictures step by step. 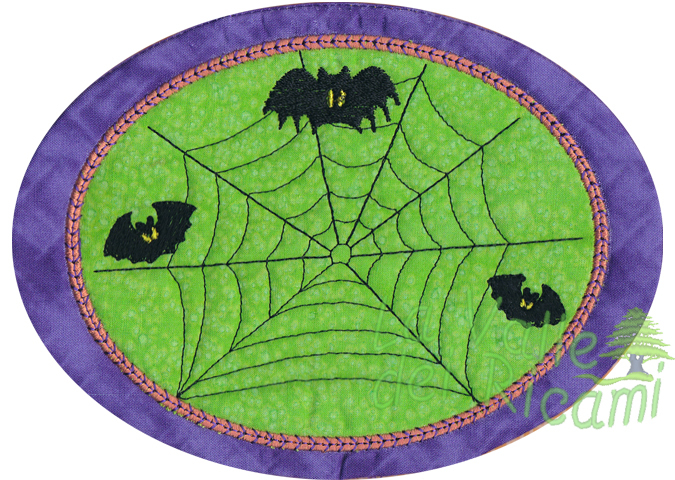 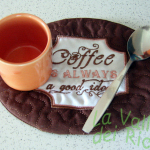 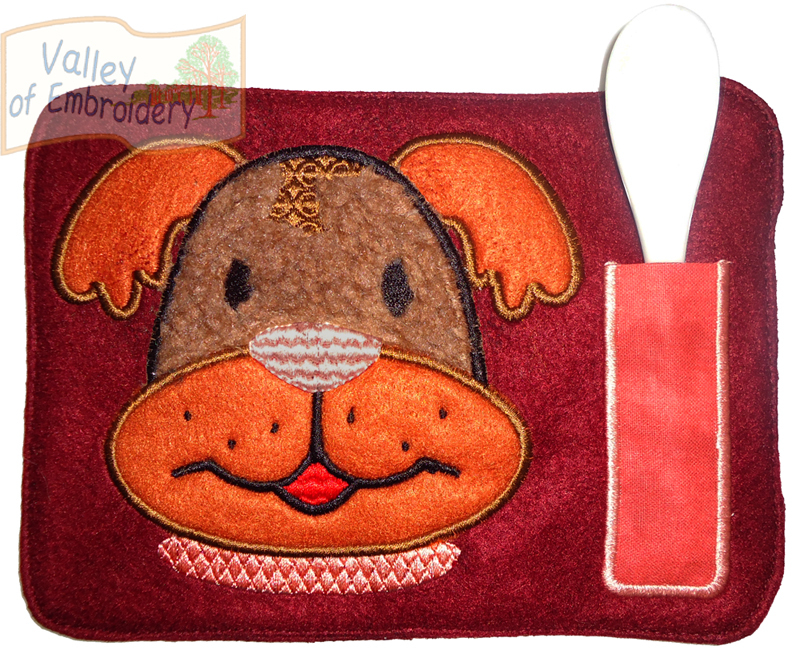 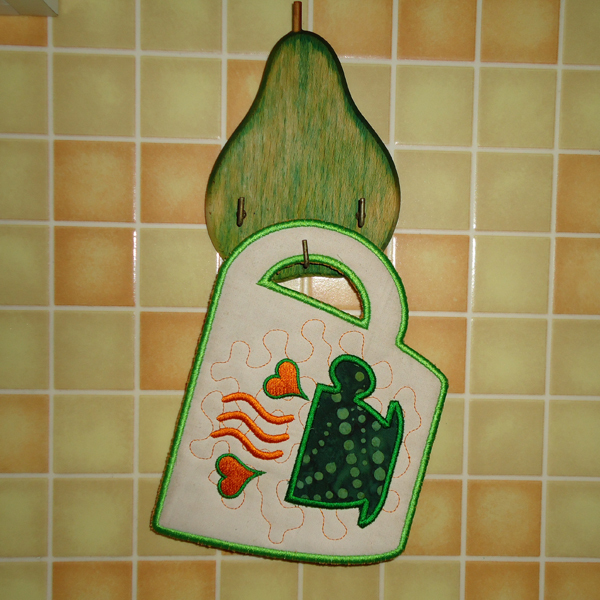 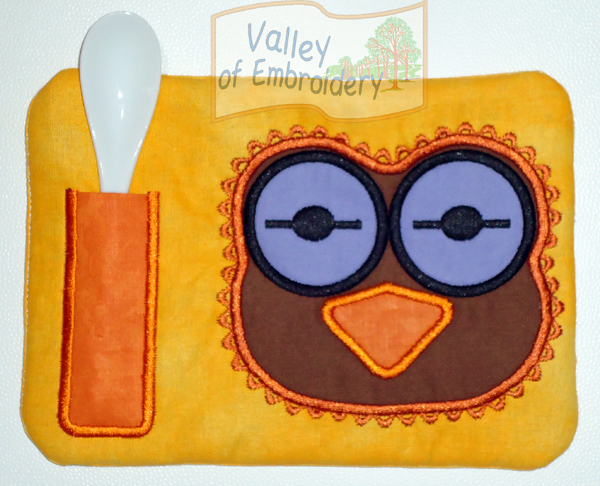 Great fun for children: this mug rug gets a small pocket for the spoon! 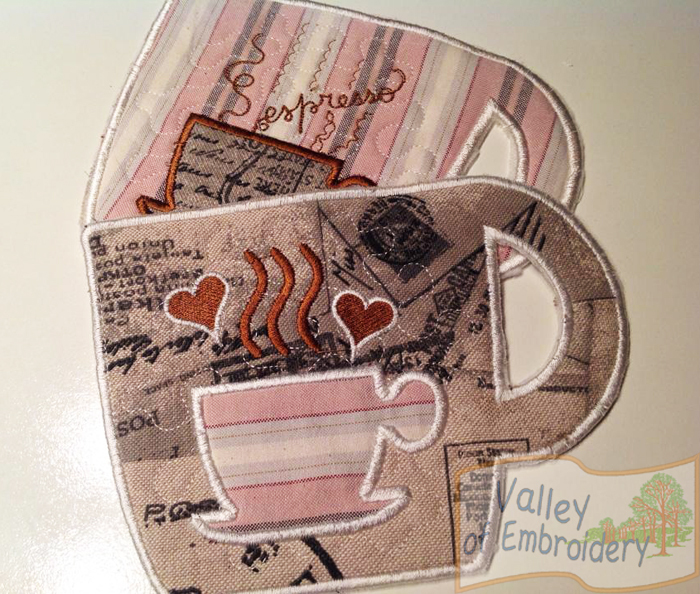 This project has to be turned inside out after the embroidey, so a quick final seam is needed to close the small hole. 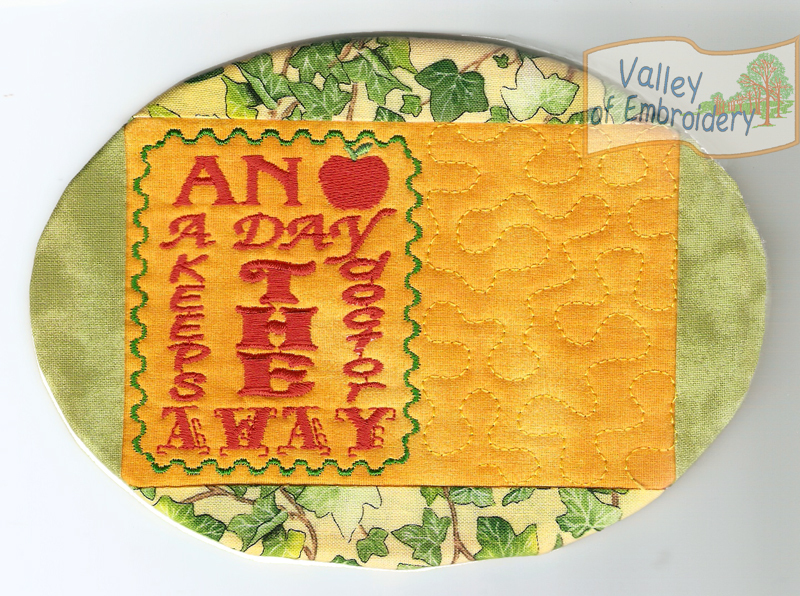 Mug rug – in the hoop design (ITH) (5″x7″ hoop) + instructions. 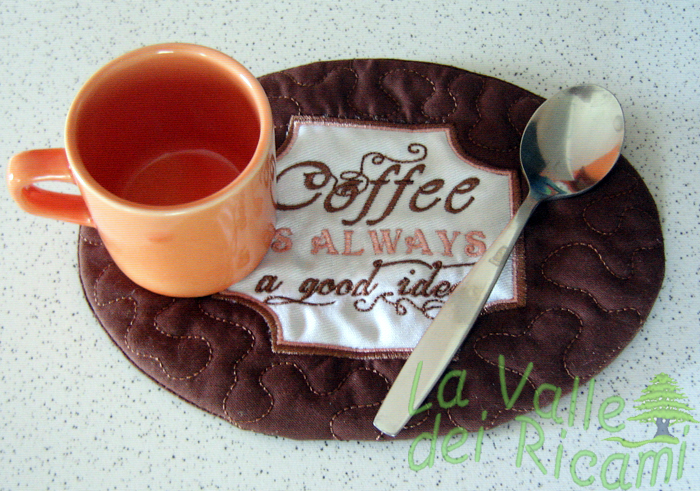 Great fun for children: this mug rug gets a small pocket for the spoon! 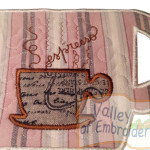 This project has to be turned inside out after the embroidey, so a quick final seam is needed to close the small hole. 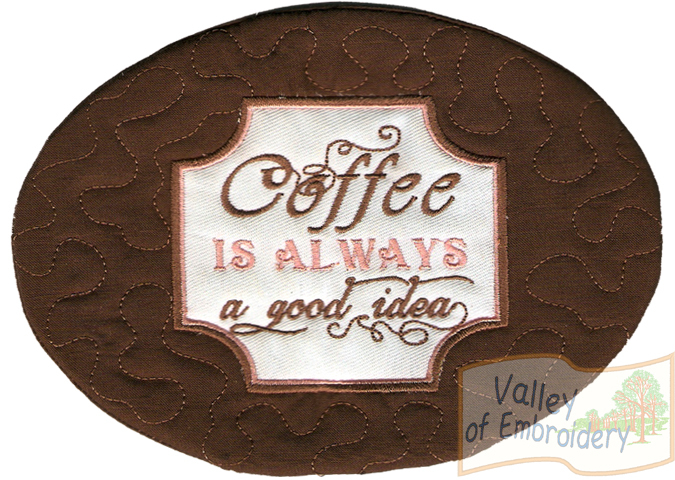 Mug rug – in the hoop design (ITH) (5″x7″ hoop) + instructions. 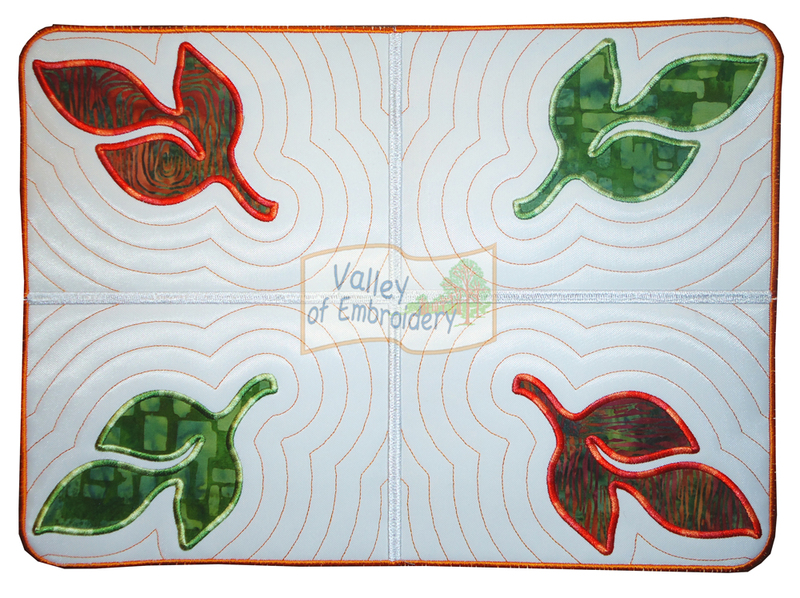 Comes with satin border: no final hand-stitching required, it’s all in the hoop! 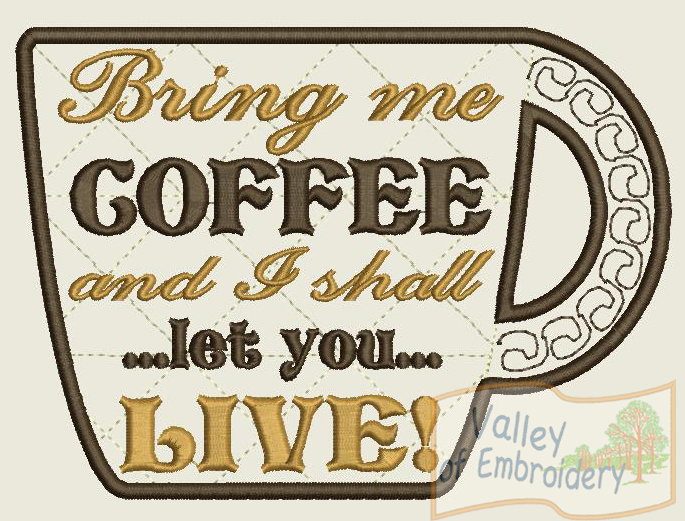 Mug rug – in the hoop design (ITH) (5″x7″ hoop) + instructions. 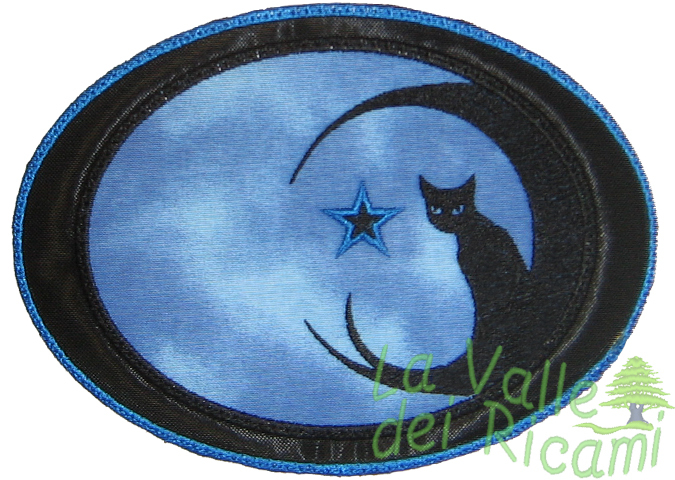 Comes with satin border: no final hand-stitching required, it’s all in the hoop! 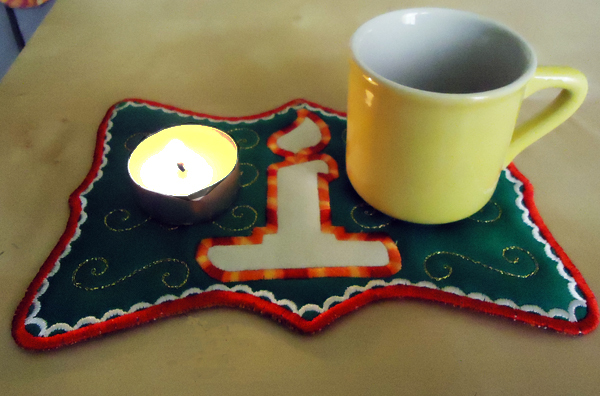 This mug rug matches with this ITH coaster. 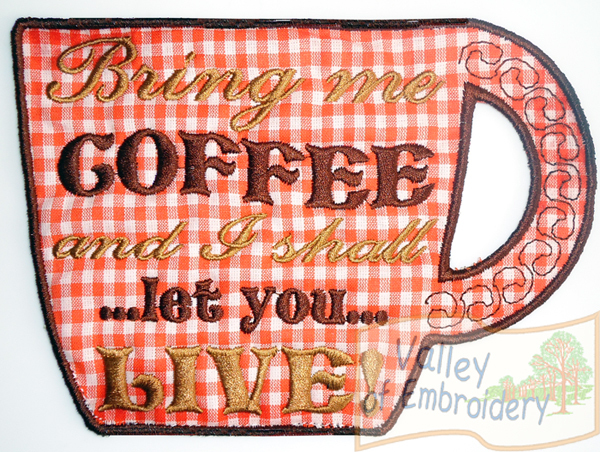 Mug rug – in the hoop design (ITH) (5″x7″ hoop) + instructions. 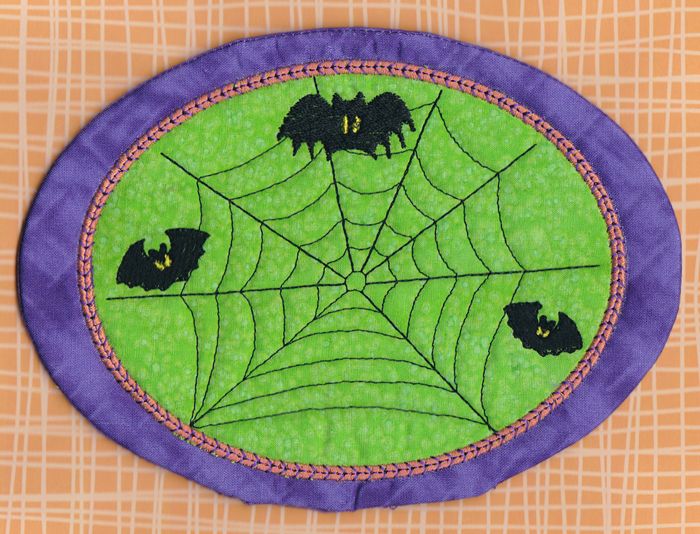 Comes with satin border: no final hand-stitching required, it’s all in the hoop! 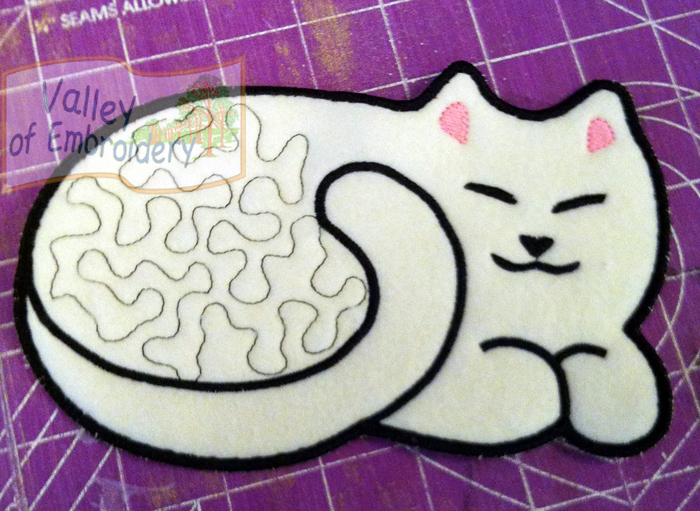 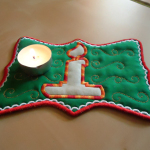 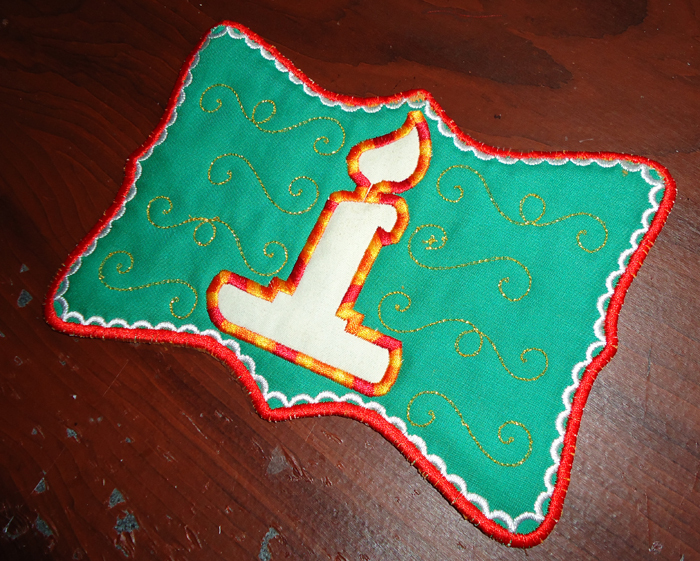 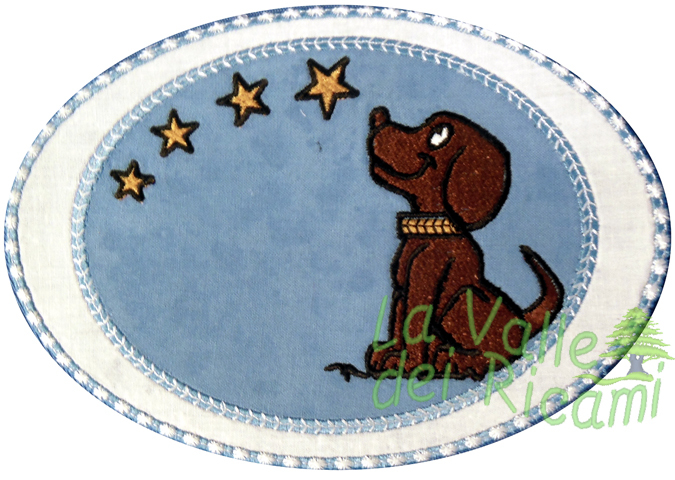 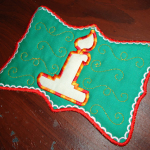 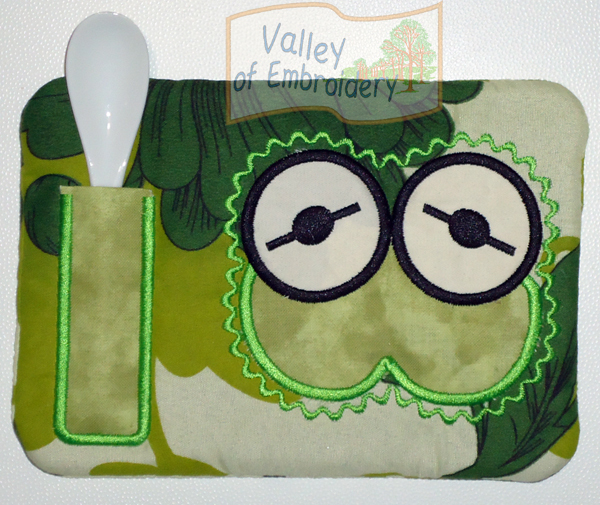 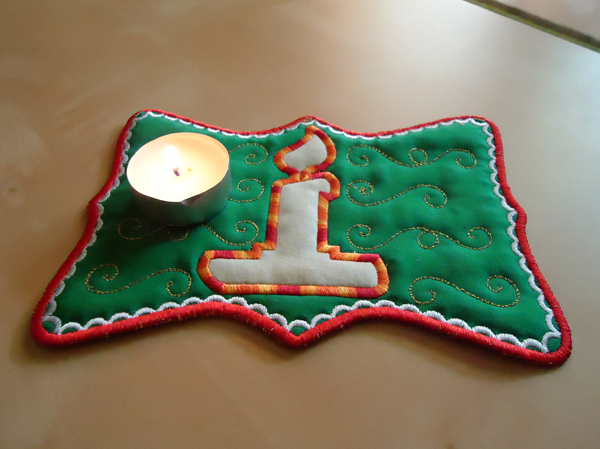 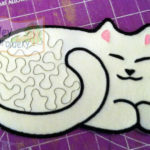 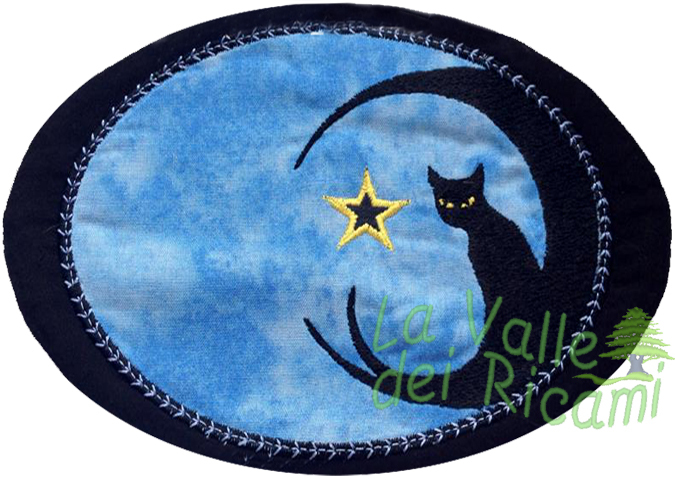 You can chose to add applique fabric on the center, or leave it blank (as I did in the tests). 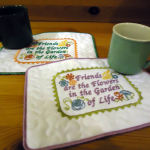 Play with colors and make pretty gifts to special friends! 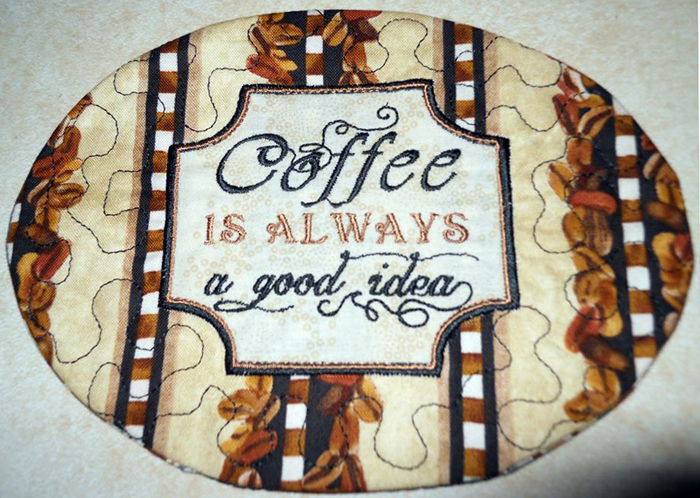 Mug rug – in the hoop design (ITH) (5″x7″ hoop) + instructions. 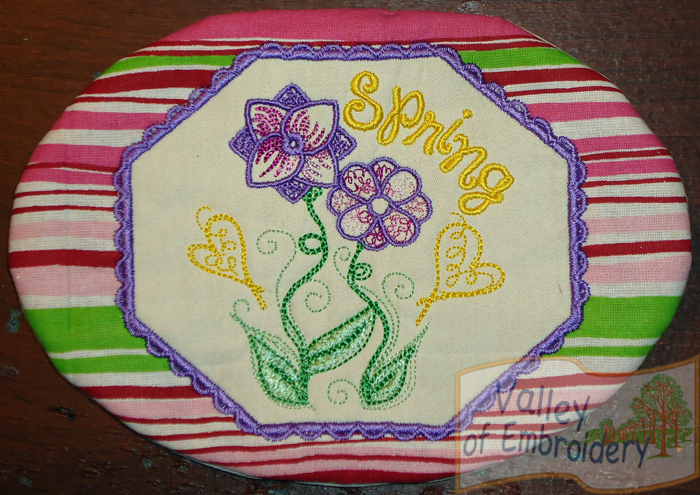 This project has to be turned inside out after the embroidey, so a quick final seam is needed to close the small hole. 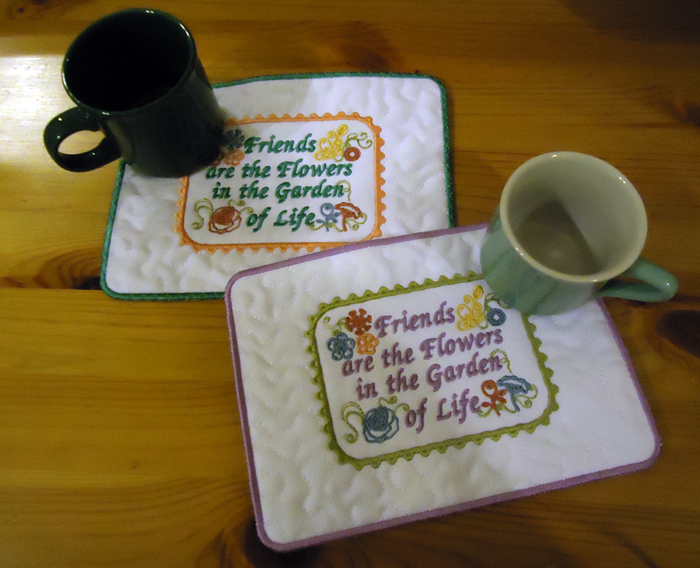 This mug rug matches with coaster “COA32” in this page. 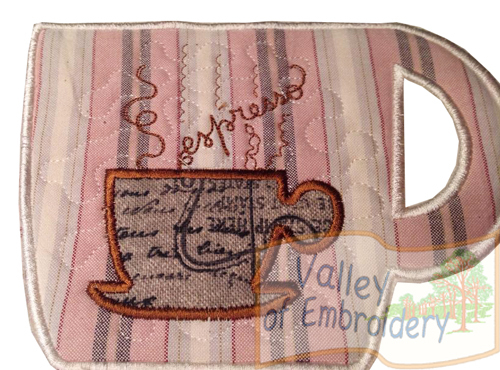 Mug rug – in the hoop design (ITH) (5″x7″ hoop) + instructions. 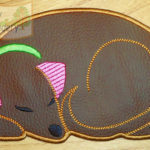 This project has to be turned inside out after the embroidey, so a quick final seam is needed to close the small hole. 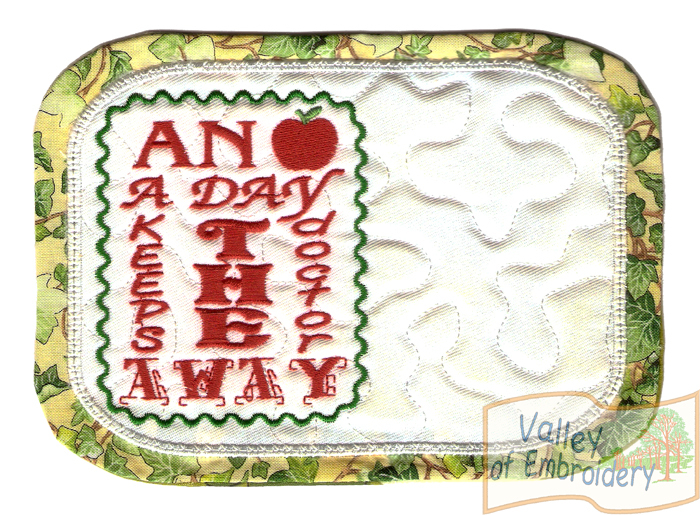 Mug rug – in the hoop design (ITH) (5″x7″ hoop) + instructions. 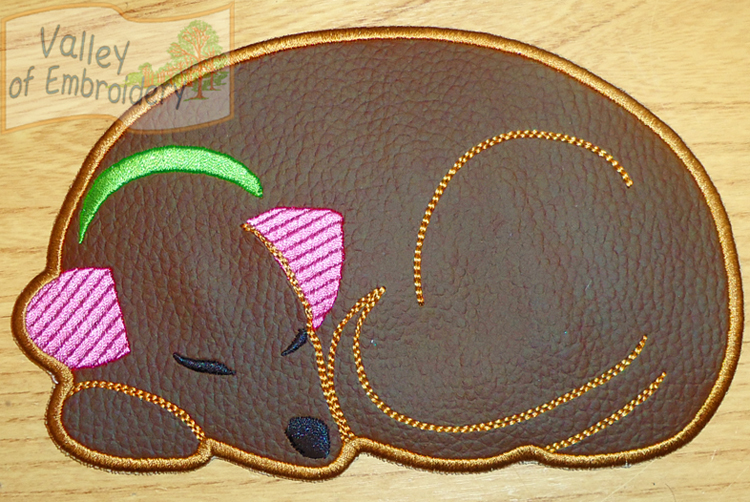 This project has to be turned inside out after the embroidey, so a quick final seam is needed to close the small hole. 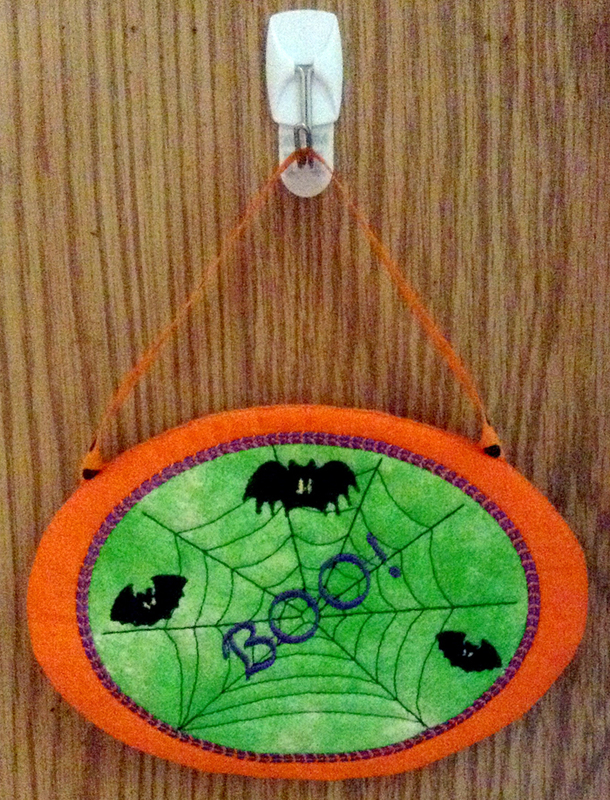 Attention: “Boo!” not included. 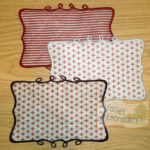 Another way to use mug rugs!